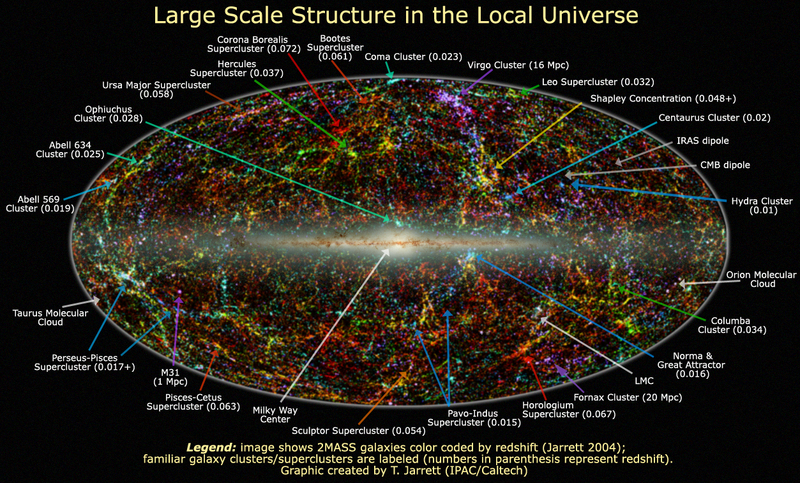 Explanation: What does the universe nearby look like? This plot shows over one and a half million of the brightest stars and galaxies in the nearby universe detected by the Two Micron All Sky Survey (2MASS) in infrared light. The resulting image is an incredible tapestry of stars and galaxies that provides limits on how the universe formed and evolved. Across the center are stars that lie in the plane of our own Milky Way Galaxy. Away from the Galactic plane, vast majority of the dots are galaxies, color coded to indicate distance, with blue dots representing the nearest galaxies in the 2Mass survey, and red dots indicating the most distant survey galaxies that lie at a redshift near 0.1. Named structures are annotated. Many galaxies are gravitationally bound together to form clusters, which themselves are loosely bound into superclusters, which in turn are sometimes seen to align over even larger scale structures.